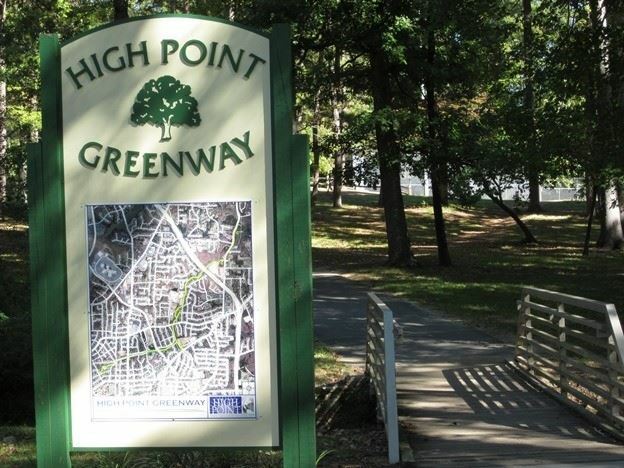 The High Point Greenway is a 3.25 mile paved trail beginning at Armstrong Park and ending at University Park. A new 1.3 mile segment from University Park to Piedmont Environmental Center is under construction and is scheduled to be completed in March, 2019. University Park (1800 Deep River Road) Closed for construction. The High Point section of the Bicentennial Greenway begins south of the Piedmont Environmental Center and runs to Gallimore Dairy Rd. The greenway then travels through Greensboro, connecting to the Atlantic & Yadkin Greenway at the Guilford Courthouse National Military Park. High Point offers 6.6 miles of natural surface trail through the hardwood and pine forest, and lakeside habitats. The track is a .25 mile walk on a paved surface. Open to the public from 5:00 a.m. to 11:00 p.m.
A 1.5 mile natural surface walking trail is located at West End Park (1701 Edgewood Drive). This course can be reserved by groups for a cross country meet for $100 per meet. Please call 336-883-3480 to check availability. All trails & greenways are open from sunrise to sunset. Unauthorized motor vehicles, alcoholic beverages, drugs, and openly displayed weapons are prohibited. Bikes must stay on trails to avoid damage to vegetation and wildlife habitat. For more information on the trails & greenways, or to report downed trees or other concerns, please contact us at 336-883-3469 or 336-883-8531.